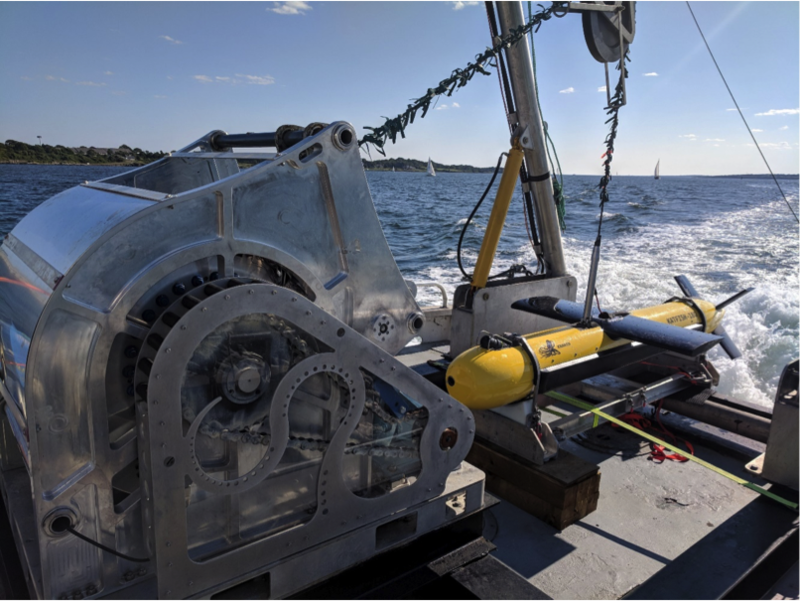 Kraken Robotics Inc. wholly owned subsidiary, Kraken Robotic Systems Inc., in cooperation with ThayerMahan Inc., demonstrated its SeaScout Expeditionary Seabed Mapping and Intelligence System during the U.S. Navy’s Advanced Naval Technology Exercise (ANTX) held last month in Newport, R.I. This was the first at-sea test and evaluation carried out since both companies signed a strategic alliance agreement in February 2018. KATFISH, an actively stabilized towfish with Synthetic Aperture Sonar providing wide area seafloor coverage, superior pixel resolution for target detection and real-time full resolution SAS processing to enable in-stride automatic target detection and classification. TENTACLE, an intelligent all-electric winch that hosts sophisticated algorithms for dynamic manual, semi-autonomous or fully autonomous control. The integrated motion reference unit tracks the motion of the host vessel, and the onboard software models and predicts the sea state. The winch can be deployed stand-alone or integrated into a completely Autonomous Launch & Recovery System (ALARS) for both manned and unmanned surface vessels. The complete system fits inside a 20’ ISO shipping container and can be rapidly integrated and deployed on vessels of opportunity. 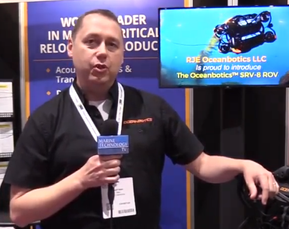 Real time sea-floor imagery transmission using secure, reliable (zero-error), data compressed, fast content delivery to cloud-based storage location to/from fixed sites and to/from mobile platforms. Cloud based data analytics, using machine learning for automated change detection of targets by comparing seabed targets against previously surveyed bottom mapping baseline information. ANTX 2018 is an annual, invitation-only event that was created by the U.S. Navy to see the future of naval technology in action today. Warfare centers, other Navy commands, universities and industry leaders are invited to showcase their technologies and capabilities during this event. The event provides an opportunity to test new unmanned systems and related technologies, while gaining access to U.S. Navy test ranges, facilities and people. There is a growing international trend of defense dollars being spent on drone development. In its fiscal year 2019 budget, the U.S. Department of Defense requested US$9.6 billion for unmanned technology and related systems — a 28 percent increase from the previous year, according to a report released June 25 by the Association for Unmanned Vehicle Systems International. “Unmanned systems and robotics are key technology areas that enable the United States to counter the range of evolving threats posed on the modern battlefield,” AUVSI president and CEO Brian Wynne said. The Navy has led all service branches in dollars put toward drones for at least the past three years, according to AUVSI. More than half of all drone projects for the land, air and sea are under the Navy’s purview. While air-based drones make up most unmanned technology projects across the services with about US$7 billion earmarked for 2019, maritime drones are increasing in interest. About US$1.3 billion of drone-funding requests support maritime drones, according to the AUVSI report. The MK 18 Unmanned Undersea Vehicle was a highlight of the 2019 budget request, with the Pentagon asking for US$75 million for the underwater drone mainly used for mine countermeasure operations, according to the AUVSI report. Other purposes for underwater drones used by the Navy include data collection and surveillance.